In Part 1, I provided some simple tips that might help you stick with your exercise program. Here in Part 2, I'll discuss this issue from a psychological perspective. • Steffi Graf held the no. 1 world ranking in women's tennis for 378 weeks in her career. That's over 7 years! The next closest was Martina Navratilova at 331 weeks, followed by Serena Williams at 319 weeks. • Edwin Moses competed in the 400-meter hurdles. He was undefeated in this event for 10 straight years! • Walter Payton carried the football 3838 times for a total of 16,726 yards in his NFL career. That's the equivalent of running 9.5 miles, but getting knocked down every 4.4 yards in the process. • Cal Ripken played in over 2100 consecutive Major League Baseball games between 1982 and 1995. • Cuba-to-Key West, 1st Attempt (1978): In 1978, Diana Nyad (age 28) set out to swim from Cuba to Key West, Florida. That's 103 miles. But, there were strong winds and heavy waves. After 41 hrs and 49 minutes, her handlers informed her that she was so far off course that completing the swim would be impossible. She was devastated, exhausted, and dehydrated. • Cuba-to-Key West, 5th Attempt (2013): On Saturday August 31, 2013, at 8:59AM, Diana, now age 64, dove into the waters off of Cuba to try again. This time, she wore a special face mask to prevent jellyfish stings. The conditions were ideal. After 53 hours, she arrived at Key West. It was Monday 9/2/13, about 2PM. She had done it. I don't know what is the most impressive aspect of this athletic feat: the sheer distance, her persistence despite failing 4 times, or the fact that she achieved it at 64 years old! Unbelievable. For even more inspirational stories, see "Amazing Athletic Feats." "REGULAR" PEOPLE DO AMAZING THINGS, TOO! • Larry Macon is a San Antonio, TX attorney who set a Guinness record by running 105 marathons in a single calendar year. • Rick Worley of Kingwood, TX, holds the world record for running a marathon on the most successive weekends: 200 marathons in 159 weeks. (source: Runner's World magazine, January 2005). • Christi Bruchok and Tauru Chaw of Phoenix, AZ set out from Ushuaia, Chile, the southern tip of South America, to ride a tandem bike up to....the northern edge of Alaska! That's about 16,000 miles. First, they flew from Phoenix, AZ to Ushuaia, but, then, had to wait several weeks for their bike to clear customs and arrive. They started their ride on January 19, 2012 and made it to Deadhorse in Prudhoe Bay, Alaska on August 2, 2013. Then, they rode from San Diego, CA back home to Phoenix. Now, if you still aren't impressed, then, consider this: both of them are legally blind! To read about their odyssey, go to: TwoBlindToRide.org. "We are realizing that people are far more likely to stay with an activity if it matches their personality," says Professor David Veale, MD, a London psychiatrist in his 2015 book, Manage Your Mood (Robinson), a consumer handbook on BA. Veale's exercise guru is Jim Gavin, Professor of Applied Human Sciences at Concordia University in Montreal and a pioneer of lifestyle fitness coaching. For example, says Gavin: "If you like to socialize, go for tennis rather than weight training. If you're shy, you're more likely to be successful with yoga than racquet sports." • Sociable: You'd rather watch a movie with friends than sit at home and watch one alone. 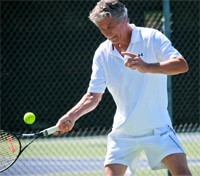 Activities such as golf, softball, and racquet sports like tennis are likely to appeal to you. Pick an exercise class such as aerobics, spinning, or step if you also need external motivation. If your chosen sport is not a team one, add a social component, suggests David Veale: "Choose places and times to exercise where there will be other people who are actively involved in exercise." The loneliness of the long-distance runner, for instance, doesn't exist if you run with a friend. • Unsociable: Those who are more solitary find that tai chi in the park, swimming, or long walks are good. With plenty of internal motivation, you can compete with yourself to go that extra half-mile. • Spontaneous: Spontaneous people generally like sports that are fast-moving so that they don't have time to think or get bored. Most team or racquet sports are perfect for "do now, think later" people. "Choose a game such as hockey, racquetball, or squash if you also have plenty of red-blooded aggression and a need to compete," Veale suggests. Do it yourself by organizing different activities – biking, ice skating, and trekking with friends. • Controlled: Controlled people will enjoy all kinds of dancing as well as Pilates, tai chi, weight training, and especially yoga. Yoga is all about holding postures, and is excellent for people who enjoy a feeling of control. 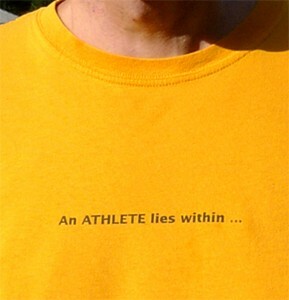 • Internally motivated: People who are internally motivated should in theory have the least problem in taking exercise, whether they opt for running, weight training, cycling, swimming, or tai chi. That only works, however, if people are self-motivated to exercise. • Externally motivated: Classes at a gym are ideal for people who need to be externally motivated. Often, these people need to have something booked and paid for or there's a chance they won't show up, whether it's a tennis court, a martial-arts class, or a skiing holiday. Don't forget the power of music – you'll pump iron more easily if you join a class where rock music is blasting. And you'll certainly cycle faster in a spinning class than riding your bike down the street. • Aggressive: You like to take charge instead of following a leader, whether at work, home or play. When you get bad service in a store or restaurant, you ask for the manager. You'll also speak up immediately when an issue arises in a relationship, instead of waiting for the other person to bring it up. You'll do well in most racquet and team sports – especially football, hockey, and rugby. Lifting weights will suit you if you also like being in control and are focused. Martial arts will be satisfying. For those whose aggression could be toned down a little, exercise might help – but only in the long term. "You won't get someone to be less aggressive by encouraging them to do tai chi or yoga," Gavin says. "It will be too contrary to his or her style. They need to gradually shape new behaviors and have to be strongly motivated to change." • Easy-going: Martial-arts classes may help to give the timid a more forceful streak. But this type of activity could also put them off. Dancing, golf and cycling all require a mix of assertiveness and civility, while walking, yoga, and tai chi are ideal for those comfortable with being alone. • Competitive: If you play a game primarily to win rather than for enjoyment, or, if you shout at the TV and get upset if your team doesn't win, you'll do well at most team and racquet sports or any kind of group training. Anything you can potentially win will be satisfying. And in every other activity, you can always compete with yourself. But try to maintain moderation, Veale says: "Setting goals can help you increase the frequency or duration of your activity. But be realistic and recognize that many activities are just there to be enjoyed in their own right," he says. • Non-competitive: For the extremely non-competitive, plenty of activities specifically discourage competition: tai chi and yoga, walking, skating, and dancing can all be both enjoyable and challenging without you having to set yourself against the world. • Focused: You methodically make your way through a website or magazine, painstakingly poring over every word rather than jumping between articles. You sit still at movies without fidgeting in your chair, and your friends say you're a great listener. If this describes you, you'll have no problem focusing on the ball in tennis or squash or learning complicated dance or tai chi moves. And provided you have a competitive edge, you should thoroughly enjoy team sports and martial arts. • Unfocused: For the less focused, find an activity where you're free to let your attention wander: walking and hiking are ideal as you don't have to think about the activity and instead can spend your time looking at scenery and being sociable. Swimming, running, and golf can also work for those with moderate focus. There's a huge divide between those who actively seek thrills – whether it's in rock climbing, mountain biking, or downhill skiing – and those who simply can't see the point. • Risk-taker: Being willing to take risks is an important characteristic in most team and racquet sports. For some of us, simply showing up to try out a new activity involves a certain amount of risk-taking. Risk-taking is all about getting in touch with being a child again. It's really great to enjoy flying down a hill on a bike – even better, down a mountain. • Risk-avoider: Those wishing to avoid risk will prefer walking, tai chi, yoga and cardio conditioning at the gym. As you get older, you get more scared because you learn about the consequences of doing dangerous things. Sometimes, to change your behavior, you simply have to be honest with yourself. What do I want? How can I accomplish that? 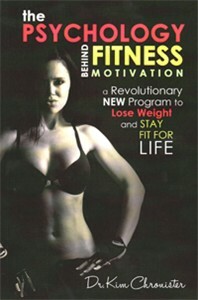 In 2013, Kim Chronister, PhD, published "The Psychology Behind Fitness Motivation." Dr. Chronister is both a licensed practicing clinical psychologist and a personal trainer. In this book, she presents the reader with a series of questions. Following each question, there is space where you can write in your answer. For some people, this kind of honest internal discussion can help to reveal why a life behavior is a problem, or, why you aren't reaching your life goals. MAKE IT COUNT WITH "COMMITMENT CONTRACTS"
OK, let's say you've read all of the Tips in Part 1, and, you've evaluated your personality type as discussed above. But, you need a stronger motivator. Well, then, perhaps a "commitment contract" is what you need. The concept here is that you specify a goal, and, a specific date when that goal will be attained. Then, you commit by making a "contract" with yourself. • Beeminder (www.Beeminder.com) was created by Daniel Reeves, PhD, and Bethany Soule, MS. It launched in October 2011, though they had been working on a prior version for several years before this. This service displays a graph of your progress on a yellow brick road. Every time you go off-course, you pay a fine. • Healthy Wage (www.HealthyWage.com) is a result of collaboration by health insurance companies, health care systems, and food companies. Their goal is to provide financial rewards to people who succeed in losing weight. For example, in their "10% Challenge" program, the individual puts up a specific amount (the "bet"), but stands to win a lot more if he/she loses 10% of their body weight within 6 months. Other challenge programs have different payment/reward plans. • StickK (www.stickk.com) was conceived by several professors at Yale University: Dean Karlan, PhD, MBA, a professor of economics and Ian Ayres, PhD, JD. (Both earned their PhD in economics). Dr. Ayres had previously authored the book: "Carrots and Sticks: Unlock the Power of Incentives to Get Things Done." From a discussion they had, Karlan came up with the idea of a commitment "store". Eventually, this evolved into "stickK" (the capital letter "K" on the end is legal shorthand for "contract"). NAME DATE LAUNCHED CARROT or STICK? Before you conclude that commitment contracts are a far-fetched idea, stickK has been featured on all the major TV news networks and in publications like TIME magazine and The New York Times, and Healthy Wage was profiled in the Feb. 2013 issue of Consumer Reports magazine. But do commitment contracts work? Researchers at U. of Pennsylvania's School of Medicine and Wharton School evaluated the impact of a "deposit contract" on weight loss (Volpp KG, et al. 2008). Subjects deposited their own cash and then had the opportunity to "win back" that cash, plus more, if they met weight loss targets. The subjects could choose to make daily deposits in any amount from $0.01 - $3.00 per day. For more incentive, their deposits were matched 1:1, and, an additional $3/day was also offered. Evaluations of weight loss occurred at the end of each month for 4 consecutive months. Health insurance providers are also rewarding their policy-holders if they exercise. 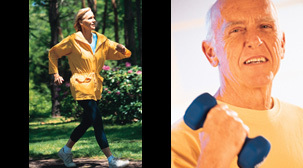 The Silver Sneakers program reimburses seniors for their gym membership fees. Medicare now allows for one "intensive behavioral therapy" for preventing heart disease, and weekly sessions for help dealing with obesity, no copay required. This will be the topic of an upcoming review. Psychological factors also come into play when trying to motivate kids to exercise. One study revealed that an adolescent's desire for personal fulfillment (ie., enjoyment, or, the desire to be fit) was a more effective motivator than peer pressure, parental pressure, or even the desire to lose weight (Haverly K, et al. 2005). The desire to have fun is clearly a powerful motivator. Lisa Witherspoon, PhD, studies exercise behavior in an exercise "lab" at the University of South Florida in Tampa. This lab is full of cool interactive games that promote exercise in a fun way. Dr. Witherspoon has found that not only do kids exercise longer when playing these games, at the end of a 60-min session, many don't want to leave. This topic is discussed in detail in: "Motivating Kids to Exercise: Is Technology The Answer?" Last but not least, while you are training, or during a distance event, talk to yourself. But, make sure you are thinking positive thoughts. Adopt a mantra....something you repeat over and over to keep you going. "Exercise Motivation Part 1: Tips You Can Use"